11 Fun Things to Do in Lafayette, Louisiana for a Ragin' Cajun Good Time! We've always wanted to get a better taste of the unique food and culture along the American southern Gulf Coast so we recently set off on a two week long Gulf Coast Road Trip through Louisiana, Mississippi, Alabama, and north Florida. The plan was to leisurely explore the coast and make our way east around the "Big Bend" and back home to southwest Florida. Starting in Lafayette, Louisiana, we flew one way, picked up a rental car, and were off. This was our first time to Lafayette and what we found not only surprised us, but grabbed us so hard, we may never be able to shake the Acadiana bug that bit us. Here are our top 10 things to do in Lafayette, Louisiana (and we haven't even gotten started on the food)! Lafayette, Louisiana lies 2 hours west of New Orleans, but might as well be a world away. The distinct French Canadian culture here was brought by the Acadians who were expelled from parts of Nova Scotia, Prince Edward Island, New Brunswick, and eastern Quebec in the mid-1700's during the British and French hostilities. 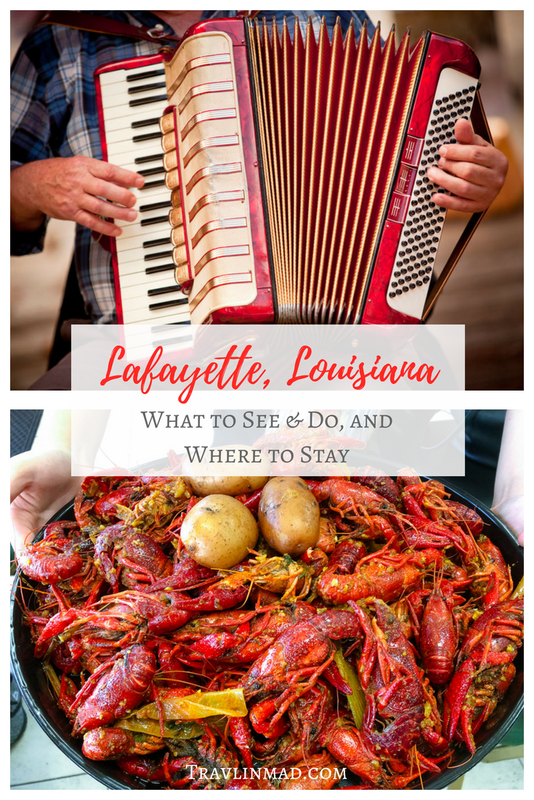 Over the many years, the word Acadian morphed into Cajun (try slurring the two together and you begin to get the idea) and today the region is rich in jaw-dropping, swampy landscape, OMG tasty food, incredibly friendly locals, and of course their signature Cajun Zydeco music. We'll just say this -- Dang, these people know how to have a good time! Tabasco food tours and cooking classes are also offered at McIlhenny, a great way to immerse yourself in Tabasco for the afternoon. But one thing you should definitely count on doing is eating at the 1868 restaurant. The prices are very reasonable unlike many tourist attraction restaurants, and it's delicious...seriously some of the best boudin sausage and crawfish we had during our stay! The centuries old Buddha was a highlight and a surprise; in its own colorful pavilion, sitting atop a large lotus blossom, it was a spectacular setting. Visit "Bird City" - hundreds of snowy egrets nesting on elevated wooden racks over the water in a huge pond mostly covered with bright green duck weed. There were lots of chicks and noise, with a few great egrets mixed in. Lafayette is a relatively small city and spread out, with several new areas with interesting shops, retail chains and restaurants. But head to Downtown Lafayette near the crossroads of Pinhook Road & Evangeline (Route 90) for some of the more unique shops and eateries in town. The area around Jefferson Street, University Avenue (East and West) and Main Street is walkable and engaging with historic shops and great photo ops like the giant letters that spell out Lafayette in Sans Souci Park (just add yourself as the "Y" in the middle). Check out local places that have been here forever like Poupart Bakery, the oldest authentically French bakery in town, and the last Borden's Ice Cream shoppe in the country for a banana split or malted shake. Downtown is a great place to meet locals who love to chat and give you great recommendations. Lafayette has two villages you can explore to get a real sense of Lafayette’s history. Vermilionville is a Cajun and Creole living history museum with a dozen or so period buildings, including 7 original structures that were moved here and restored about 20 years ago. Tours are self-guided and historians throughout the buildings are a wealth of information about the homes, the original families who lived there, local crafts and 19th century Acadiana life. Kids will love the local flora/fauna exhibits, and some cool demonstrations of the weather in south Louisiana. Acadian Village is similar to Vermilionville with less of a living history element, and guided tours instead. There are eleven structures here along with a General Store. Download the "Vermilionville Living History Museum" app in the iPhone App Store to take their audio-visual tour (available in both English and French). Any local culture with enough venues and "dancehalls" to keep your dance card filled for months you just know is gonna be a good time. Whether you're up for local zydeco dancing or a good honky tonk, this is where you'll find the spirit of Lafayette... any night of the week, in any part of town you'll find locals dancing to a Cajun beat. But don't let that stop you from joining in.....the simple steps are easy to learn and the locals are more than welcoming and willing to lead you around the floor! We had some of the most fun of our entire stay the night we danced to Terry and the Zydeco Bad Boys at Artmosphere, a funky and friendly bistro and night spot that serves good food and drinks til 2am. We danced as best we could to the fast temp Zydeco beat and the joint was jumpin' (literally, the drinks on our bar table were spilling over!). The locals who all seemed to know one another danced til the wee hours doing what looked like a Zydeco Cajun jitterbug. Many restaurants offer live music and dancing like Randol's Restaurant and Cajun Dancehall, or Prejeans who has live music nightly. You'll also find nightly jam sessions all around town - there's a good Cajun jam every Wednesday at the Blue Moon Saloon. Great music, good food, nice people, and a very fun night. When you're in Lafayette, Go! To say we were pleasantly surprised at the food scene in Lafayette is a huge understatement. In fact, Lafayette certainly ranks up there as one of the top food destinations in America! Not that we didn't expect great food -- we just didn't expect so many great variations on the Cajun theme, nor the new and modern twists that local Chefs are creating. Before our visit, my only knowledge of local food in Lafayette was crawfish and gumbo. But after eating so many good variations, I can tell you there's no one thing called gumbo, or étouffée (Aay-too-FAY), or Lafayette's famous pork and rice sausage known as boudin (pronounced boo-DAN). Sure, there are several integral ingredients that go into a traditional Acadiana gumbo like the "trinity" (sautéed onions, celery, and green bell pepper) and filé (pronounced (FEE-lay, which is ground sassafras leaves). Everyone here will also tell you that the flavor is all about how you cook the roux. But there are as many variations as there are parents and grandparents who made it before, especially with boudin. Everyone adds their own special touch, ingredient, or technique. And it's all good. So take your time and try as many as you can. What we especially loved about Lafayette is their simple plate lunches. Haven't heard that term before (or in the last 50 years)? It's actually a throwback to a time when working-class Americans needed a cheap and filling meal. But the plate lunch thankfully never left Lafayette, and today you can find good ones all around town, along with a story or two from the local sitting on the stool next to you. 8. Get a Daiquiri To Go! One of the strangest and yet so wonderful experiences a foodie (or boozie) can have in Lafayette is the beloved Daiquiri To Go, a phenomenon as simple as it sounds. Louisiana's use of the straw as a litmus test to the state's open container law has turned Drive Thru Daiquiris into a favorite booze experience. Served in generous sized styrofoam cups, the wayside drive-thrus stay legal by fixing a piece of tape over the straw hole, and handing you the straw "on the side". Pull up and choose from hundreds of flavors of frozen daiquiris, and pick it up at the window. If the straw comes out of the paper and into the cup before you stop driving, you're busted. In Lafayette, you're never far from the bayou, and taking a boat tour to get into this unique ecosystem is a fun way to spend the day. There are several local swamp tour companies who do airboat swamp tours, paddling excursions, sunset tours, birding and wildlife tours, and even photography trips. Cajun Country Swamp Tours leaves from nearby Breaux Bridge, and popular McGee's tours the Atchafalaya Swamp about 30 minutes from Lafayette. There are so many things to like about Lafayette and southern Louisiana. If your visit is just a few days, you'll only be scratching the surface, so be sure and hit these highlights. We were happy to have gotten a little taste of the local flavor, but there's still so much more! Many thanks to LafayetteTravel for hosting our overnight accommodations during our stay. As always, all opinions are our own based on our firsthand experience.